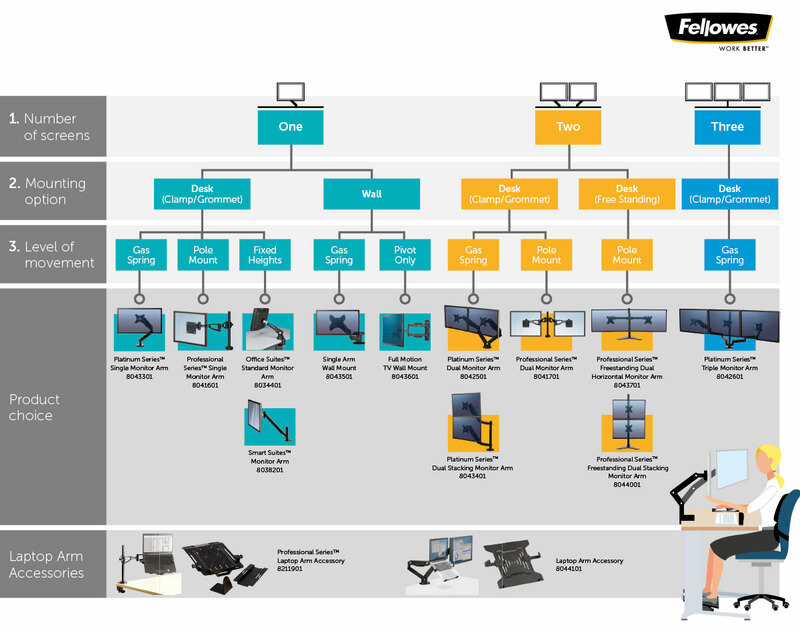 To celebrate the recent addition of the Fellowes Professional Series and Platinum Series monitor arms to the Posturite site, we thought we’d try to make it a little easier for you to see what the differences are between each model. Why should we use monitor arms? When you sit at your computer, the posture you adopt is influenced hugely by the height, distance and angle of your screen. Too far away and you might find yourself hunching forwards over your desk. Too low and your head will naturally tilt down, putting a huge amount of strain on your spine. Over the hours, days and weeks, positions like these can eventually cause pain and injury which can in turn, as we know, impair performance and increase the likelihood of absenteeism (all costly for a business). Monitor arms elevate your computer screen (or screens) above your desk. They are also fully adjustable so any user - even hot-deskers, can instantly find a position that's comfortable for them. But which monitor arms are appropriate? - How many computer screens do you use? - How much space do you have to play with? - Are you buying for a hot-desk? There are four monitor arms in the Professional Series. This is the range to choose if your budget is tight (prices start at: £51.54). All four models offer basic pole mount technology so all you have to do is slide the monitors up and down the pole to find the ideal height. All arms also feature a handy cable management system so if you're a stickler for neatness you don't need to worry about wires ruining your beautiful minimalist desk. All four models in the Platinum Series feature higher-end gas spring technology. This offers smooth, weightless suspension of your monitors in a range of configurations to suit your role. Adjust effortlessly to find the perfect working position and keep connected with the two USB ports integrated into the monitor arms themselves. We also stock monitor arms from other respected brands, including CBS and Ergotron.